On Friday, May 4th a group of faculty, staff and friends filled the Brown Library atrium to honor the English Department’s Dave Merrell. After forty-six years of teaching and service Dave is retiring. He leaves quite a legacy. “One of the things I fought against was being another small Bible college that thought of itself in a provincial way,” Dave recollected. 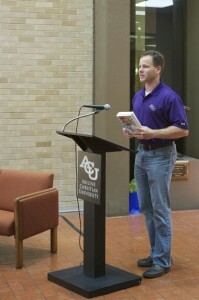 By doing things like starting the Honors program, introducing courses including World Literature and Business and Professional Writing, initiating the freshman English exit exam, and going out and raising the funding for the Culp Professorship, Dave was instrumental in leading ACU in new directions and making it more competitive with other institutions. The stuff of legend is Dave’s grasp of every detail of the university, especially in matters of the curriculum. After the cutting of the retirement cake and dipping into the punch bowl, a variety of individuals stepped forward to offer accolades. These included former ACU provost Dwain Hart; current English Chair Cole Bennett; former English Chairs Bill Walton and Nancy Shankle; Dr. Chris Willerton; and Dean of the College of Arts and Sciences, Charles Mattis. 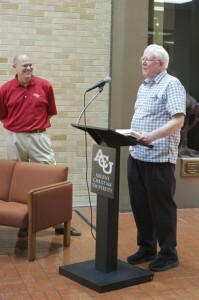 ACU legal counsel Slade Sullivan honored Dave for being a charter member of the NBA–the Noon Basketball Association, a group of young and old faculty and staff who for decades have been driving to the hoop in Moody in a friendly competition. A special "NBA" gift for Dave--The Book of Basketball. What’s next for Dave? First off, he says he’s promised he’ll take his grandkids to Florida. After that he anticipates doing some part-time work for ACU. We also suspect he’ll be doing a bit of reading with the new Kindle the department gifted him with. We wish him well!